Lori Forgay of the Denton Record-Chronicle informed readers last week of a book concerning Texas Civil War monuments. 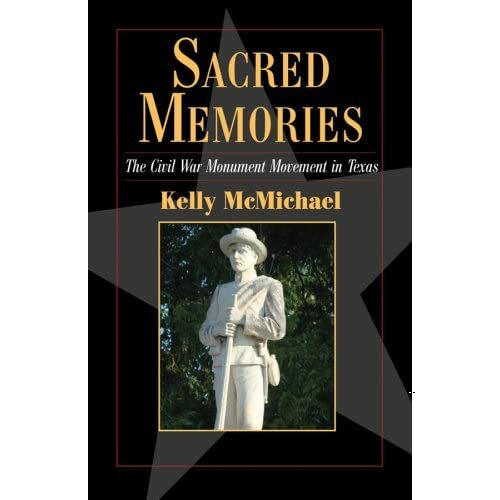 “In Sacred Memories: The Civil War Monument Movement in Texas,” author Kelly McMichael explains what Civil War monuments meant to the people who erected them in Texas. After travelling to all 68 of the major Texas Civil War monuments, McMichael examines their history and what the monuments symbolize. McMichael also examines the controversery that is involved with all monuments, for trying to tell one side of a multi-faceted story. McMichael’s book is available through amazon.com.